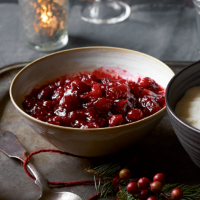 This quick and easy-to-make cranberry sauce will make your Christmas Dinner. It's also great with leftovers on Boxing Day. Place the cranberries in a small pan. Squeeze the clementine juice into a measuring jug and make up to 150ml with cold water. Add to the pan and gently bring to the boil. reduce the heat and simmer for 5 minutes, or until the berries start to burst. Add the sugar and stir. Simmer for 7-10 minutes, or until the sauce is thick. Transfer the sauce to a small bowl. Serve warm or cold. Make the sauce up to 1 week in advance, cover and keep in the fridge. Stir well before serving. Make as above and freeze up to 1 month ahead. Defrost thoroughly overnight and stir well before serving hot or cold. This recipe was first published in November 2014.